My Favorite Color, Greenville, and God’s Grace! This is Day 16 of 31 in my Write 31 Days series: 31 Stories of God’s Grace. I also am linking up for the Five Minute Friday. The FMF is hosted by Kate Motaung on her blog Heading Home. Today’s prompt is “Green.” Write for five minutes; unedited. One doesn’t need to look far to see that “green” is my absolute favorite color. I mean look at my blog….it’s a little overloaded with the color green! 🙂 And my friend Gretchen used to tease me when we would go shopping together. She would spot a green item of clothing and wait to see how long it would take for me to find it. And I also just happen to be wrapped up on this cool Fall night in my favorite green quilt given to me by the dear quilters of Dilworth Lutheran Church when I left there two years ago. But green also brings some other recognitions in my life too. Green is the color for mental health awareness. And as many of you know, I am the daughter of a woman who lives daily with a mental illness. Green also reminds me of a ribbon that is in a scrapbook I have from my college days. It was my friend Chewy’s favorite color, but it also reminds me of how Chewy left this earth. Chewy committed suicide. Yet despite all of these colors of green in my life, I am reminded of God’s grace and how it rains down and is always and ever enough! Tonight I also got to jump on a Periscope with all of the #fmfparty ladies who happen to be in GREENville, South Carolina for Allume. I so deeply wanted to be there myself, but flying out of Minot, ND is not cheap at all. When I looked at tickets, they were over $800. YIKES! But these ladies made me smile tonight as we interacted on Periscope together. I felt like I was there with them all. After they signed off and I hopped back onto Twitter for the #fmfparty, I found myself reflecting on these dear friendships. These friendships only could be orchestrated by a God whose grace is daily sufficient for each and every one of us. I cannot even begin to thank God for his grace and the gift of these friendships in my life. I feel like I am one lucky gal who has been the recipient of God’s grace over and over and over again! And it has been God’s grace that has helped me grow into the woman of faith that I am today! This entry was posted in Uncategorized and tagged #write31 days, 31 Stories of God's grace, Five Minute Friday, green by tara.ulrich. Bookmark the permalink. I hope that someday I get to attend Allume. It is on my Bucket List! PS I love how you love green and associate the color with God's grace. Jennifer, I love that we both love green and Minot. I remember you telling me that your parents met here on a blind date. I have grown to really like Periscope. You do have to be a little careful of trolls but you can block them. It is up too if you give it a try but I actually love broadcasting and interacting with others. I love the green shirts your boys were wearing! Yes mental health awareness is so important! Yes Tara, you're life is mighty green 🙂 I tried the periscope but I'm on my dinosaur laptop and it just wasn't working…drats! $$$ prohibits me from attending the conferences too, after Shane and I go on our cruise that we're saving for,(at $10-40 here and there, Allume or Shespeaks is next on my list 🙂 Shane and I are in the number 30 spot today. Christy, that is cool that you and Shane are going on a cruise. Allume is on my bucket list. Hopefully someday. HA! Thanks for saying I made it look easy. Great post, Tara! Green is definitely your color! So glad you shared your words about your fave color here. I love getting to know you better! You're a gift! Thanks Julie! I love getting to share a bit of myself with you all too. And thank you for saying I am a gift. You are gift to me too! Tara – I enjoyed reading your post this morning. It is literally filled with your joy and is making me smile, even now. 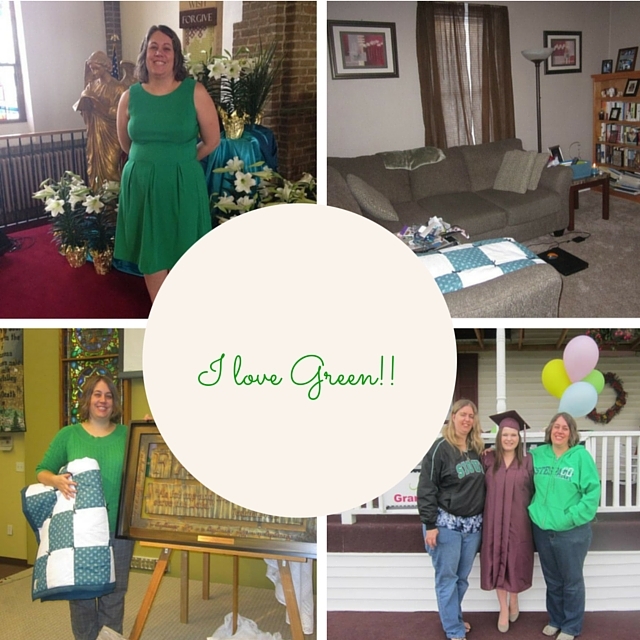 Nope, never would have realized your favorite color is green (ha!). It's my daughter's favorite as well. I would love to attend a writing conference someday, but am happy for you that you attended via Periscope (I can't seem to keep up with all of the technology options out there – is it something like skype?). Happy for you and hoping you continue to have a blessed weekend. Thanks Janet! I am so glad that my words convey my joy and made you smile. I love that it is your daughter's fave color too. Periscope, yes is kind of like Skype; a live stream where viewers can comment etc. Hope you had a blessed weekend too! Im so glad you did! missed you on periscope last night! You're right, green is all over your place:) But I like how you associate so much of God's grace with it. Happy Friday to you! Green is not my favorite color, but a lot of things I like are green lol. Such a fun post, learned lots of things about you today!!! Thanks Laura. It was so much fun to write. Glad you loved learning about me. I've been thinking about doing periscope. I am definitely intemidated by the whole idea, but we'll see. I should have known you liked green! It's my favorite color too. It has been for probably 20 years. Hooray for us greenies? Natalie, Periscope intimidated me at first too but now I LOVE it! So fun that green is your fave color too. Yes hooray for us greenies too! as soon as I saw the GREEN prompt, I thought of you and knew you've love it! I especially love your collage! 🙂 I am glad you loved the collage! Okay… I might just be a little GREEN with envy after scrolling through all the above comments – LOL! I'm small stuff & have to remind myself that I'm not writing for followers or comments but, to share my heart & trust that someone will be touched. I love this 5 minute Friday post. Glad I got YOU in the 5-4-5 today 😀 Blessings to you!! Please don't be green. It is so easy to get caught up in the numbers game, but we each have been called to share different words on our blogs. I'm sure your words have touched many. Blessings to you too! Thanks Carol! It totally did. I read this last night and I loved it! Thank you for watching our Periscope silliness. I evidently laugh a lot when in those situations. Wish you were with us! Mary, I am so glad you loved this post! I loved the Periscope silliness. Wish I was there with you all too…one of these days! I liked reading all the associations the colour green has for you. I think the colour suits you, and I love the green dress you are wearing in the photo. Thanks Carly! That green dress in the photo is one of my all time fave dresses. Tara, I'm so glad I found you. You know, I visited Minot years ago and stayed at a RV park on my way to Winnepeg, CAN. I thought it was gorgeous in late August. I loved your green comments and I will find you from now on. So cool that you have visited Minot before. Im so glad you loved my green comments. I look forward to seeing you from now on in this space.